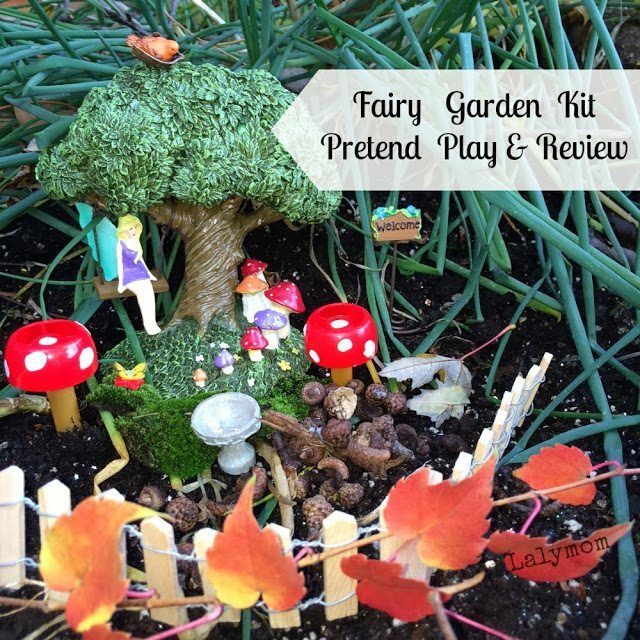 This is a sponsored post for a Fairy Garden Kit by CraftProjectIdeas.com, powered by Horizon Group. The kit was provided for free by Horizon Group and I am sharing my honest opinions about it. When the folks at CraftProjectIdeas.com asked if I would be interested in reviewing a new Fairy Garden product I was pretty excited as my 3 year old is newly interested in fairies. Initially I figured it would be a craft kit, containing stickers or craft foam pieces to assemble. I learned that it was actually an Outdoor Living product that is available in Walmart's Gardening Center. Look for them to be available for six weeks only, from the end of October. Hmm. Curious, I thought. There are three different varieties, a Traditional Fairy Garden Kit, which we received, a Fairy Tea Garden Kit and a Terrarium Fairy Garden Kit. I looked at all the items beforehand and I have to say they are surprisingly small. I was a bit unsure who this kit was aimed at. I knew it was obviously not for very young children because of the glitter, pebbles and small pieces but I think it would be better suited for someone a bit older than my daughter. Mainly because you have to carefully perch the fairy on the swing and not bump her or she will fall off. That said…we truly did have a lot of fun with it! Ladybug and I initially did this as a special Mommy & Me activity while baby brother was napping. We brought our box of goodies outside, along with some pouch cap toadstools that we had made for a previous fairy activity. We headed to our normal fairy garden spot. Yes. We have a “normal” fairy garden spot. Don't you?? 1. Layer your planter with garden soil. 2. Place Fairy accessories as desired. 3. Sprinkle magic fairy glitter and display. We already had a spot available however, so we did without the planter. Here are our amended directions, perfect for use with a 3 year old despite my initial uncertainty! 1. Set up fairy garden in a special spot. 2. Add Fairy Glitter Dust. Lots of it! 3. Oh! Look! Notice the beautiful Fairy Leaf Ladder Nearby! Talk about where it could lead the fairy! Discuss the pros and cons of your new Fairy Real Estate option! 4. 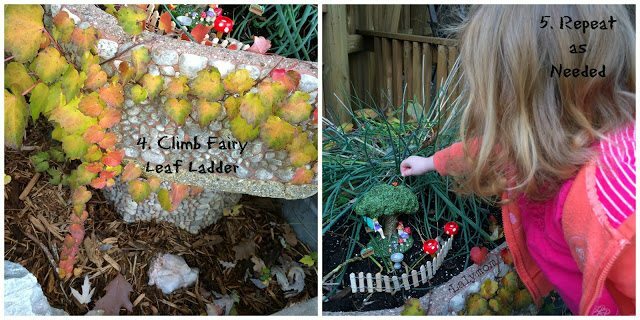 Have fairy climb the leaf ladder (even though she could clearly fly!). You can see our finished results in the top picture…I have to say it was PRETTY impressive! 😉 If the spirit moves you, make up a song about the experience! As you can tell my three year old really enjoyed playing with this Fairy Garden Kit! It Inspired a lot of Fairy Pretend Play for us. The best part was clearly the special glitter that was included. It was white iridescent glitter with white iridescent stars. AWESOME. We played for baby brother's entire long nap! If you have a fairy lover in your family, this is a fun little set to check out! Thanks to CraftProjectIdeas.com for including us in this preview. CraftProjectIdeas.com is powered by Horizon Group USA and is a source of photo and video tutorials to inspire and educate children with arts and crafts. Follow them to be inspired at Facebook, Twitter, Pinterest and YouTube! 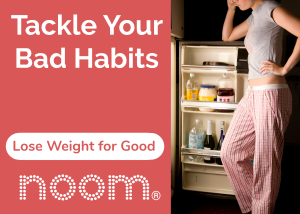 For more ways to have fun with your kids, follow Lalymom on Facebook and Pinterest! This looks adorable! Such creative play! Really, really cute! I love it! I’m not the best at trying to find things to add to a fairy garden so this would be right up our alley. 🙂 Thanks for sharing!